Are you having trouble with email copywriting? Don’t worry; you’re not alone in this misfortune. Email marketing copywriting is demanding, and it’s sometimes best left to professionals. But, where to find email copywriting services and, more importantly, how to recognize the best ones from the less adequate ones? 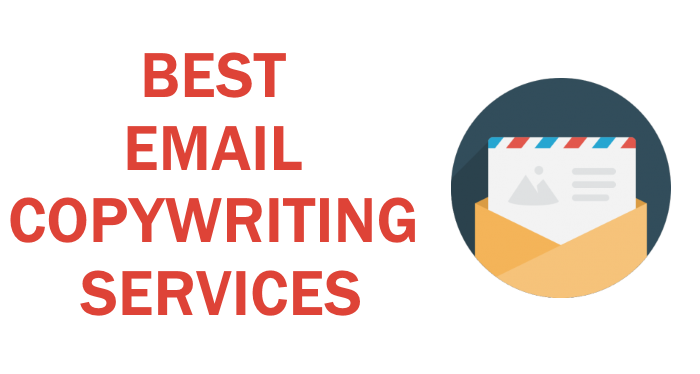 Search no further, because we offer a list of best email copywriting services right here. Copywriting is written advertising, ‘salesmanship in print.’ Email copywriting is essentially a game of prompting people to take action by promoting, advertising and, finally, selling an idea, product or service. A good writer needs to be savvy and a little bit sly. So, it’s better to ask what is good email copywriting and how do you achieve that? To some, it may seem like brain surgery, but it’s actually not that difficult. You just have to know how to do it. Now, you might be having issues with one or more of these. Let’s say you don’t fancy yourself a good writer. It’s ok; not all of us are. While it is a skill and can be taught given enough time, why not hire a person who already knows how to do it well, and go do your own thing? Sometimes people get frustrated because they can’t wrap their minds around email copywriting. Especially if they work in sales or some adjacent industry. It’s basically persuasion and promotion; so why is it so hard? What you have to understand is that selling something in person and in writing are two completely different things. Just because you can sell snow to Eskimos while talking to them doesn’t mean that you will be good at email marketing copywriting. So, don’t feel bad – ask for help! The basis of good business is knowing when to delegate. Today, people tend to overlook email marketing copywriting as an outdated practice. With social media and the marketing opportunities they offer, spreading like wildfire on the Internet, it’s easy to think of email as no longer relevant. But is it so? Actually, it’s quite the opposite. Social media has done a bang-up job of desensitizing its users to marketing content, so when they see it, they just skim over it and disregard it. However, with email marketing, you have an opportunity to get a second look from a potential customer because it feels more personal. When people feel that something is focused directly on them, they will pay closer attention. OK, so, say you got their attention. But, how do you preserve and captivate it? You only have a couple of seconds before the person you sent your email to decides if they will read it all the way through or not. That is where email copywriting services come in. Why hire an email copywriting service? A professional email copywriter will give you a finished, effective product in much less time than it would take you to achieve the same thing. That is if you were even able to. They will do it better and faster, for sure. You might be wondering how they can save you money since you are paying them after all? It’s simple. By outsourcing your copywriting, you free up your time to do your own job, which you are actually good at. It’s a huge weight off your shoulders and one less thing for you to worry about, if you hire someone else to deal with it. What will email copywriting services do for me? Email marketing copywriting is basically storytelling. In a nutshell, professional writers will sell your product, whatever it is. They do it by utilizing some key rules of good email content writing. The subject line is the most important thing in an email, as it is supposed to lure the reader to open it. A good writer will give you a subject line that packs a real punch and provokes curiosity. The email itself has to fulfill the promise given in the subject line. It’s important to know how to balance the boastfulness of the subject line with the reality. The reader has to not only open the email but to click on the target site it is advertising. By using the words that call out to action, like “take,” “ask,” “buy,” you are letting the readers know what they can do in the email. You need to say it all – but briefly. Summarize in a couple of sentences what you want the reader to know. Nobody wants to read a page long letter; that’s a snooze-fest. Your customer needs to know what exactly you are offering. Vague language or generic offers will not hold their attention. However, that doesn’t mean it’s supposed to be dull. Make it funny and catchy or whimsical. A good marketing email is relatable. You don’t want to come off as too stiff or too technical. Be approachable and use a conversational tone, like you’re two people chatting on the street. You thought we meant you, the reader, didn’t you? Utilize that in email marketing, since it clearly works. Speak in the second person, directly to the reader. Personalize the content, so that it’s relevant to an individual. A good copywriter knows that capitalizing words can be your worst enemy. If you capitalize everything people will get the impression that you are yelling at them. Capitalize only the MOST important things. Value content over embellishments and benefits over features. What you write is always more important than what color or font you write it in, or how many pop-up pictures you have. And so on. Email marketing copywriting is a craft or an art, to some, and you have to do it flawlessly to get the desired effect. When you’re in the business of attracting customers, you need a perfect marketing strategy – and outsourcing professional email copywriting service can go a long way. Driving responses to your emails and increasing purchases is your goal, and professional email marketing content writing is a way to get it. So, even if you are a firm believer in the do-it-yourself approach, keep in mind that some things you just can’t do like a pro. Or that you can’t do it properly over and over again. Keep it versatile enough in the future? Make it fresh and entertaining? Utilize new trends and include them in your pitch? Keep your point short without dwelling on details? Influence the reader to do your bidding? A professional writer can do all this and so much more. They will use not only their knowledge but their creativity as well, to subtly captivate your potential customers. A great writer will communicate what you wish you could, and they will do it with clarity and precision while always staying on topic. Now that you know you need them, and what they are supposed to do, it’s just a matter of finding the one that’s the right fit. You have many options to choose from. The internet is full of freelance writers who work by the hour and email marketing content writing companies. So, to aid your search, we’ve done extensive research and compiled a list of the best email copywriting services on the Internet. Websites like Fiverr or UpWork offer a huge database of freelance writers. These websites are so versatile in their offer that you can find practically anything for an affordable price. There you can find a bid that will fit your budget, no matter what it is. Hiring freelance writers is a bit like Catch 22. It’s unquestionably the cheapest option, as you can get requested services for prices as low as $5. But, when hiring a freelance writer, you work with only that one person. That means not only a longer turnaround time but less security as well. If you are more on the cautious side, you might prefer a company, but if you prioritize price above all else, try some freelancing writers for your email marketing content writing needs. Additionally, you can choose who you want to work with and contact them directly. On the other hand, you have to put your complete trust into one person that you found on a website that’s not developed for the services you seek. On these sites, you can hire a freelancer for virtually any job. That is a plus if you need more than one cheap service and are working on a tight budget. On UpWork you can not only browse and choose writers but also post a job that you need a freelancer for, which is a nice feature. Because of the multiform nature of these sites and the fact that on them you can find whatever you are looking for, we have included them on our list. Reach Mail is one of email copywriting services that will create and send email marketing campaigns for you. This Chicago-based company has been on the market since 1991 and is a leader in cost-effective email marketing. However, we’ve ranked them low on our list of best email copywriting services because, while they do offer custom emails, their main offer is applying template emails to your brand. For a monthly fee, Reach Mail will send anywhere from 7,000 to 120,000 targeted and fully customizable email messages for your business. This company offers an abundance of additional services like social media sharing and live customer support, for example. However, because it doesn’t offer as unique content as some other companies do, Reach Mail isn’t optimal. But, template-following email copywriting might work for some businesses, so we included them on our list. Gravitate Design is a versatile company of self-proclaimed web architects. They have been on the market since 1991, and have since grown a popular business that deals with web design, digital marketing, and maintenance and hosting. Email marketing content writing and email marketing copywriting are just some of many services this company offers. They focus on nurturing and maintaining a relationship with your clients while always keeping your brand in mind. Gravitate Design writes one of a kind emails that will catch the eye of even the most reluctant reader and turn them into a customer. You can contact Gravitate Design for a pricing offer, as they differ from order to order. A bonus is that this email copywriting company will meet all your further needs if you have any. When it comes to digital marketing, they are experts in the field. The promise of rising above the “inbox noise,” as well as helping your customers understand the benefits of your product and ultimately selling it, is an alluring offer. High-quality email marketing content writing landed them on our list. This email marketing content writing company understands how much of a difference an impactful email marketing campaign can make. Content Development Pros offer to do extensive research on industry trends and your business in order to compile a custom written product that will reach and attract new customers. Content Development Pros company has a relatively versatile offer. Price varies depending on the number of requested emails, what turnaround time you choose and the word count. So, for $35 you can get one custom 350-word email, delivered to you within three business days. The prices go up from there, so, for example, five 500-word emails will cost you around $250. This email marketing content writing company offers many content writing services and has an unlimited-revisions policy. With them, you can also get any other kind of email writing as well. So, if you need one or two emails, the price is relatively reasonable, while a bigger order might cost you a pretty penny. But, for your money, you get unique and fresh, SEO-optimized content. It will also be proofread and vigorously edited by a team of writers. Content Development Pros promises engaging email marketing copywriting that will result in favorable response without ever losing the attention of the reader. The quick turnaround combined with prices on the lower end makes this company an adequate choice with a fair quality-price ratio. Copify is a company that provides easy access to a network of approved writers that are US natives. It has a very transparent overview of all its employees. That way you can see each writer’s customer rating, credentials, and the number of orders completed. Although the company chooses the writer for you, you have final say, and can also select the option of determining the right writer for yourself. They offer all kinds of copywriting services, including email marketing copywriting. It is just a matter of finding the right staff member for your needs. What sets Copify apart from other similar companies is that, while it is still essentially a freelance company, you can choose to work with professional copywriters for a premium price. In addition to any kind of copywriting, Copify also offers blog packages, delivered and published for you for a monthly fee of $89. Turnaround time depends on the quantity of your order. Approximately a 500-word piece will be done in 48 hours. With around 1000 writers at your disposal, this fast turnaround time is not surprising, but still a big plus. Copify is one of the email copywriting services with the best price-benefits ratio. However, it is just a freelancing platform. You can select the option of working with a professional copywriter, but in that case, the prices go up, which reduces the overall advantage of the offer. Article Writing offers email marketing content writing as part of their wide and versatile service selection. It employs professional copywriters who will produce content that will move your customer and entice it to action. That is precisely what you want when it comes to email copywriting services. They also promise consistent responses and fresh content every time. For a standard 400-word email, you will have to pay $20. Prices in this company vary depending not only on the word count but on quality of writing that can be standard, professional and expert. That is a little disconcerting, as the existence of professional and expert options implies that the standard option is somehow subpar. That is why we couldn’t rank Article Writing any higher on our list of best email copywriting services. This company offers article, blog and product description writing as well as website and social media writing. Their email marketing copywriting service is among the popular ones, and on their website, you can see a lot of testimonials from previous satisfied customers. Customer satisfaction is high on their list of priorities, as their unlimited free revision-policy can testify. Article Writing works very hard to keep your customers engaged with your brand, keen to strike a conversation and eager to purchase your product. Express Writers are first to admit they don’t offer cheap service. At this email marketing copywriting service, it’s all about the quality of content. You have to hand it to them; at least they’re honest. They don’t try to sneak additional costs by you or charge you ridiculous fees. What you see is what you get, and that is why we’ve ranked them in the middle of our list despite their high price. And, boy, it’s high. They offer two different services for $375 and $450. For that money, you get an email sequence of five 200-word emails and 400-word emails. Now, that seems like a lot. On the other hand, considering that all your content will be written by copywriters with five or more years of experience in the field, maybe the price is justified. You decide for yourself. Express Writers can produce any other kind of content you need, and at lower prices too. This email marketing copywriting company produces the best quality emails, targeted to a specific audience, which are strategically conceptualized to increase revenue and entice action. Even so, if you are not satisfied with the product from the first go, they also offer an unlimited number of free revisions. Sometimes, quality costs a little bit more than we are prepared to pay. Still, bear in mind that high caliber content is a worthwhile investment. Pro PR Copy is a company that employs the best professional copywriters and editors. It offers excellent email copywriting services for a relatively low price. This Wisconsin-based company was founded in the heart of the Midwest almost a decade ago, but it has since extended its reach all over the US. Still, it prides itself on their small team of locally bred and trained expert copywriters. Pro PR Copy provides emails that will, for sure, achieve all that you were dreaming about. They know email marketing copywriting like the back of their hand, and with writers well-versed in marketing, journalism, sales and a number of other industries, it’s easy to expect a high-quality product. The price varies depending on the word count, and it’s the same for all services. So, for a 250-word email, you will pay $39, while a 2000-word one will cost you $109. The prices are very affordable, and they don’t fluctuate much. That gives a strong impression of a straightforward service and no-nonsense approach. Pro PR Copy can provide you with web, blog and social media writing at the same price. Quick turnaround time and free revisions are a bonus. The amazing quality-price ratio isn’t easily matched, and that is why Pro PR Copy takes the high fourth place on our list. Writer Access started as a freelancing platform over eight years ago. It has since developed into a small army of writers, all with a great deal of experience in email marketing content writing. As it grew, this company started including more people in their teams, so now they have not only copywriters and content writers but analysts and strategists as well. They all work together with a goal to deliver the best email marketing content writing to their customers. When you hire Writer Access, you get a premium email marketing copywriting experience. They make sure that the product they deliver is optimized per your requirements. Email copywriting provided by this company will be unique, fresh and eye-catching – all for the purpose of increasing your revenue. Writer Access offers monthly subscriptions that include various services. They also offer discounts for yearly subscriptions. This company has a transparent pricing system and gives its writers 70% of the commission. Knowing that the writers are well paid gives you a rare kind of security, as well paid people are more likely to do their jobs with joy and increased efficiency. All content writing and copywriting services are available. They also offer brand building and content planning. A great quality-price ratio placed this company close to the top of our list of best email copywriting services. And the very top of our best email copywriting services is reserved for GoSuperb. It’s a relatively young company, founded in 2015, headquartered in Amsterdam, Netherlands. They offer distinctive, high-quality email marketing content writing provided by motivated, in-house writers. The company prides itself on amazing writers with perfect English proficiency. They deliver content on time, and it’s always polished and well-researched. You know that, with GoSuperb, your email copywriting needs are in good hands. GoSuperb provides services at a price that varies from $0.019 to $0.029 per word, based on the quality of writing and amount of research required. This company provides free, unlimited revisions until it meets your requirements. Any kind of copywriting and content writing service is also at your disposal, and they all cost the same – per word. What landed GoSuperb on the desirable number 1 spot on this list, besides their impeccable writing, is their money-back guarantee. If you find just one grammar mistake, you get a full refund. Now, that’s a fantastic incentive. Overall, GoSuperb offers a magnificent service. The quality-price ratio is excellent, turnaround times are fast, and the money-back guarantee makes them unequaled in their field. You won’t make a mistake if you hire this company to propel your email marketing copywriting business to the next level of greatness.